Nathalie Kelly (left) will play Cristal in The CW's new Dynasty. Linda Evans portrayed Krystle in the original ABC series. A reboot of Esther Shapiro and Richard Shapiro's 1980s primetime soap opera, Dynasty, has been picked up by The CW for the 2017-2018 television season. The series is the story of two of America's wealthiest families, the Carringtons and the Colbys, as they feud for control over their fortune and their children. 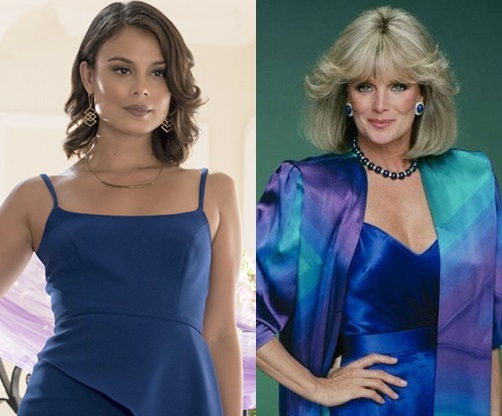 The series will be told primarily through the perspectives of two women at odds: Fallon Carrington (Elizabeth Gillies) — daughter of billionaire Blake Carrington (Grant Show, Melrose Place, Devious Maids, Ryan's Hope) — and her soon-to-be stepmother, Cristal Jennings (Nathalie Kelley), a Hispanic woman marrying into a WASP family and America’s most powerful class. On other CW news, the network has also picked up Black Lightning, the first African-American DC Super Hero to have his own stand-alone comic title. The show stars Nafessa Williams, who played Deanna Forbes on One Life to Live in 2011.